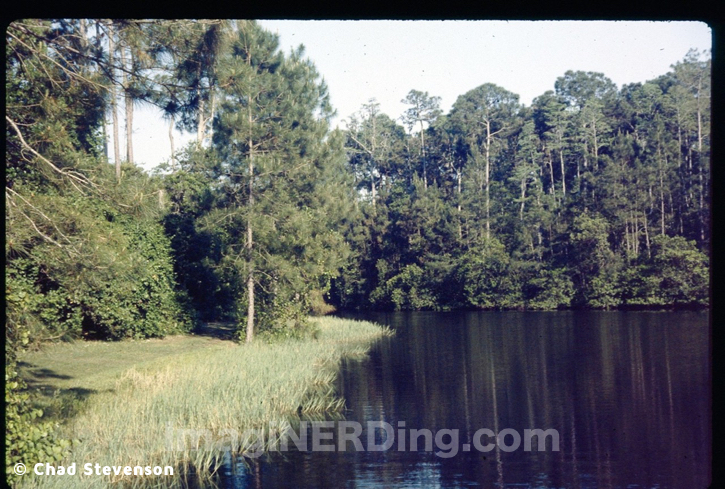 Finding Treehouse Villas photos, along with images of most 1970s Walt Disney World, can be pretty difficult. Long-time listener of Communicore Weekly (the Greatest Online Show™), Cadet Chad, sent me the following amazing images of his family’s (circa) 1983 visit to Walt Disney World. 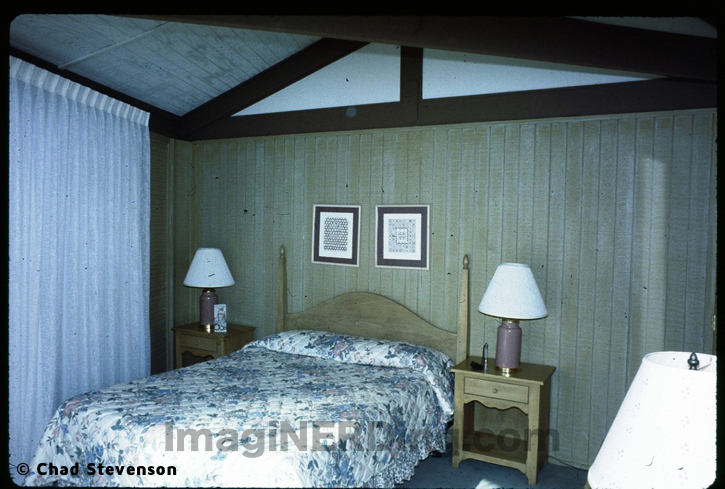 Chad’s father was prescient enough to take some very interesting photographs of the interior of the Treehouse Villas. 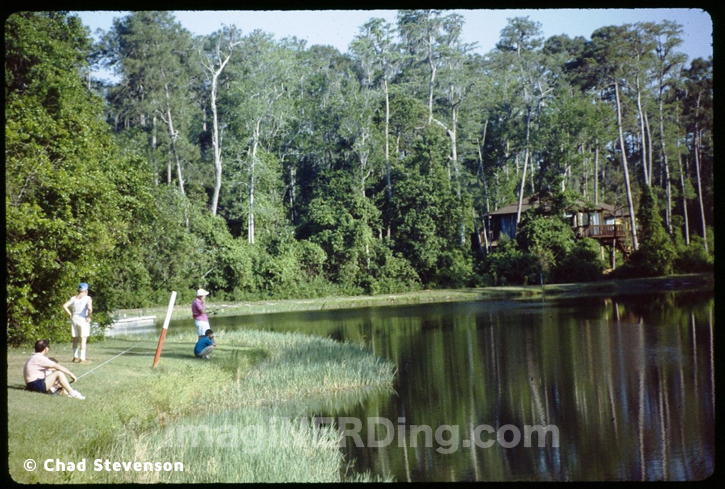 I do hope these Treehouse Villas photos bring back some great memories of vacations past. Chad told me that he’s the one crouching in the blue shirt. The other people were just random guests. It’s hard to imagine a Walt Disney World vacation in which you just hung around by the canals. 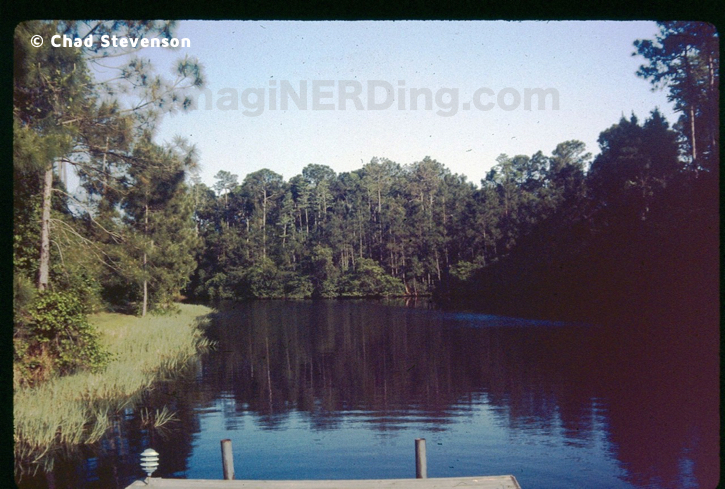 It’s hard to find vistas like this at Walt Disney World any longer. I’m assuming this is a dock of some sort. It does have a light, but there aren’t any cleats visible. Maybe it was just for fishing? Talk about an almost postcard-perfect shot! 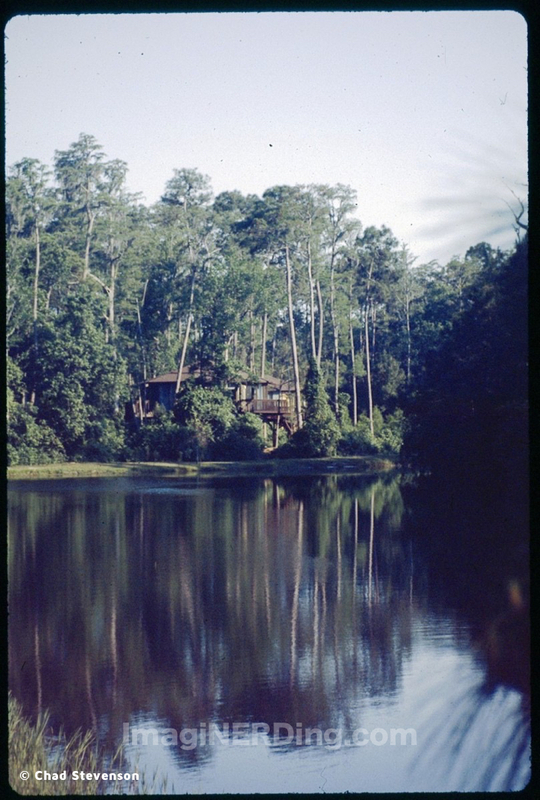 This is the same Treehouse Villa thats in the first image. 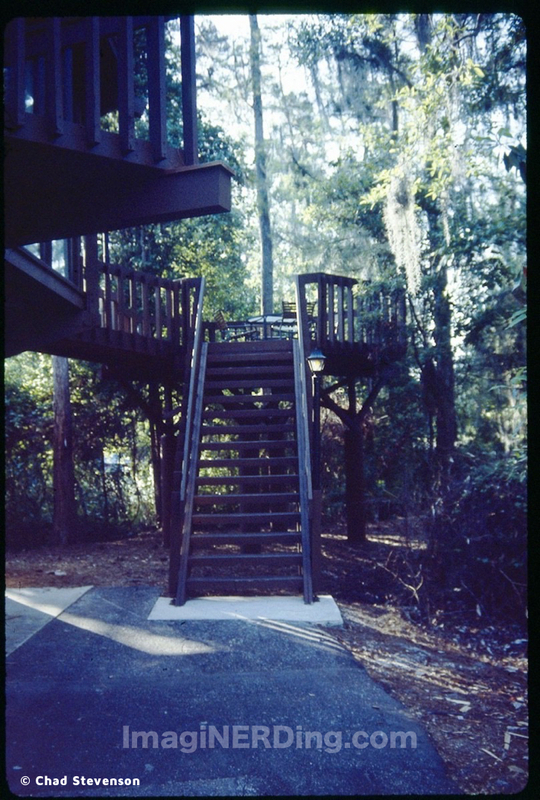 Here’s a photo of the stairwell leading to the deck of the Treehouse Villa. Chad told me that they didn’t rent one of the golf carts, so they had to walk to the bus stop. He does remember a van picking them up occasionally, but he’s not 100% sure. 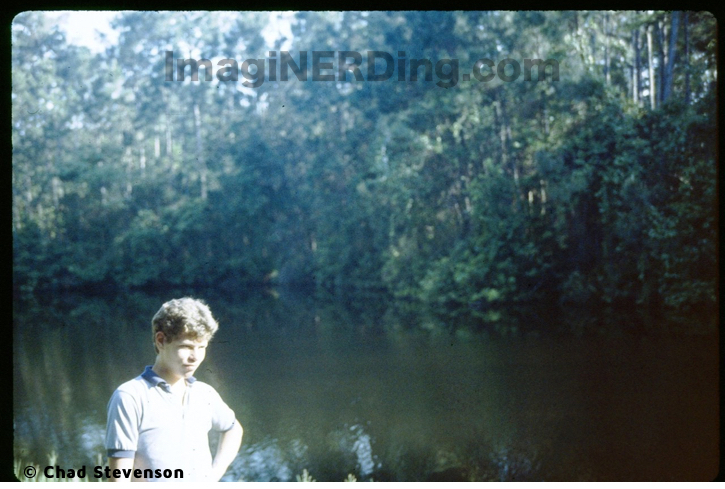 Wildlife was pretty abundant back in the day. 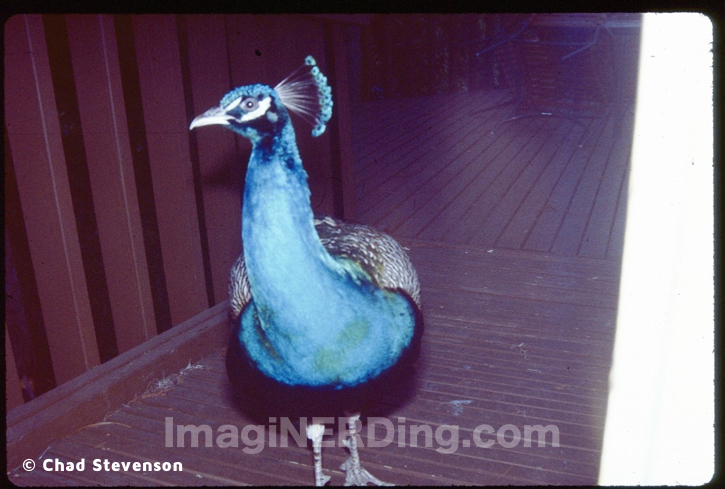 This peacock was hanging outside and let the photographer get fairly close. 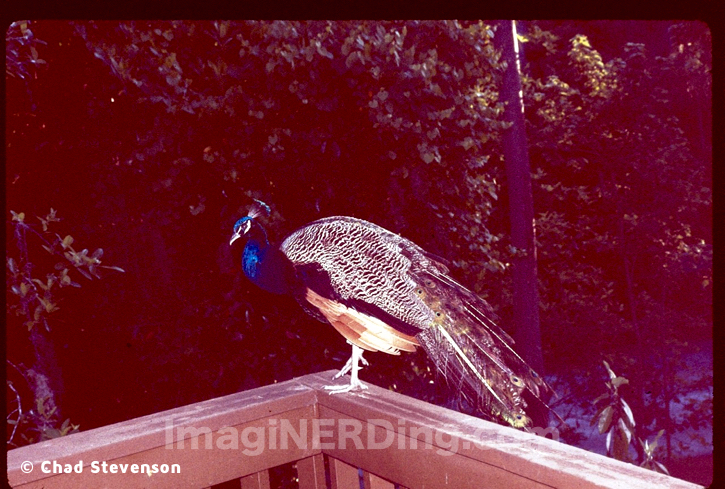 What a brazen peacock! Apparently, he wanted to come into the Treehouse Villa. Maybe they were used to being fed by guests. 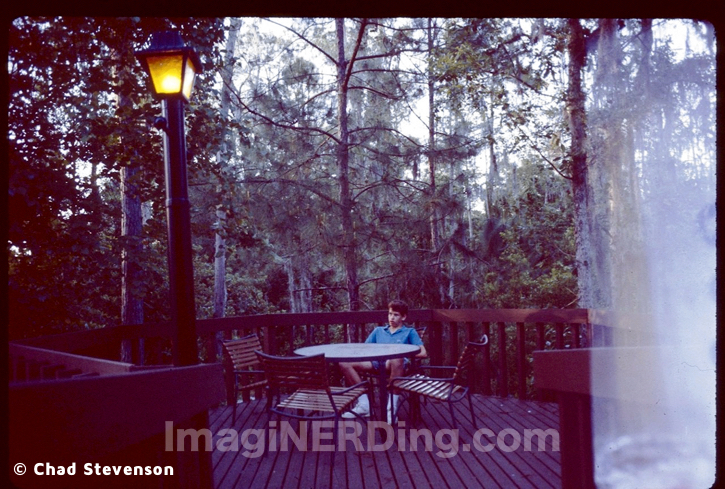 Here’s Cadet Chad sitting on the deck of the Treehouse Villa. 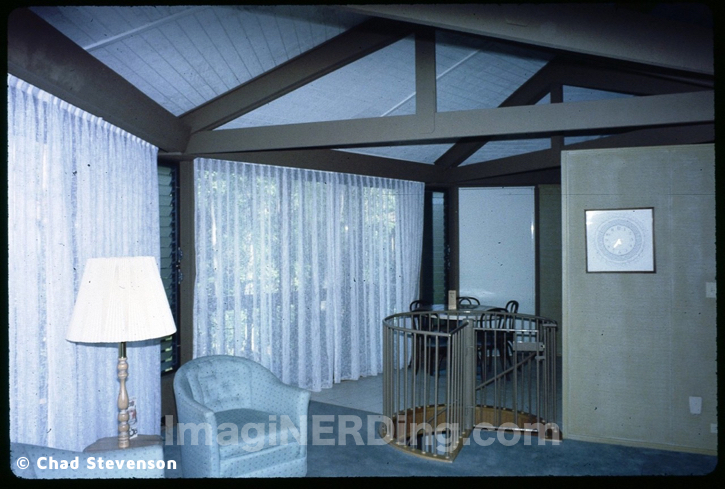 Again, Chad’s father took some amazing Treehouse Villas photos, especially of the interiors. It looks like Cadet Chad is hanging out on the couch of the living room of the Treehouse Villas. And he’s watching something on television. 1983 was still way too early for Stacey! I found list of available channels from a travel guide from the early 1980s. Turn to Channel 5 in your room for continuous information on all of the things to see and do at Walt Disney World . For today’s events and special happenings, tune to channel 10 for “Around the World Today.” Channel 1 – Recorded music; Channel 2 – WESH, Orlando (NBC); Channel 3- WMFE, Orlando (Educational); Channel 4 – WTOG, St. Petersburg (Independent); Channel 5 – Walt Disney World Information; Channel 6 – WDBO, Orlando (CBS); Channel 7 – Lake Buena Vista Hotel Plaza Information; Channel 8 – WFLA, Tampa (NBC); Channel 9 – WFTV, Orlando (ABC); Channel 10 – Walt Disney World Information “Around the World Today”. The walls look like they’re covered in a wallpaper that extends onto the door. 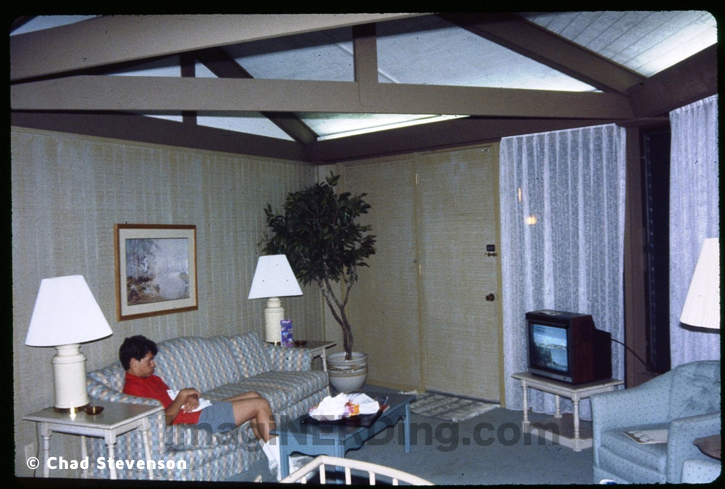 Based on the following image from an earlier post, the Treehouse Villas did go through a re-decoration at some point before 1983. 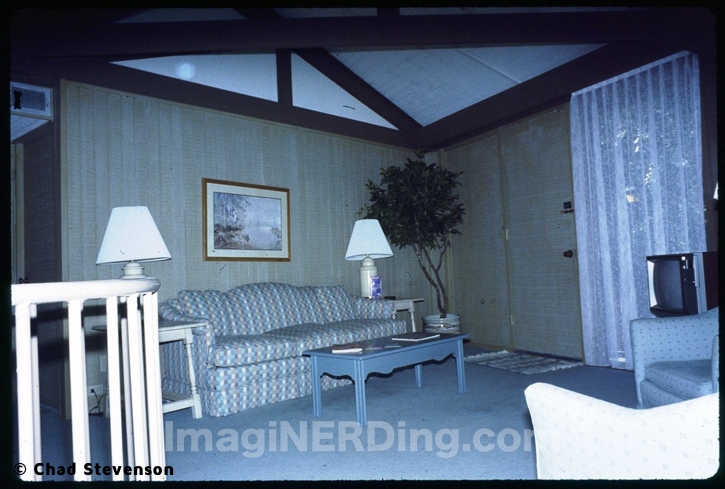 You can see that the walls had wood paneling and there was shag carpeting. Also, the ceiling beams would be painted a darker color. A view of the Treehouse Villas family room, sans Chad. 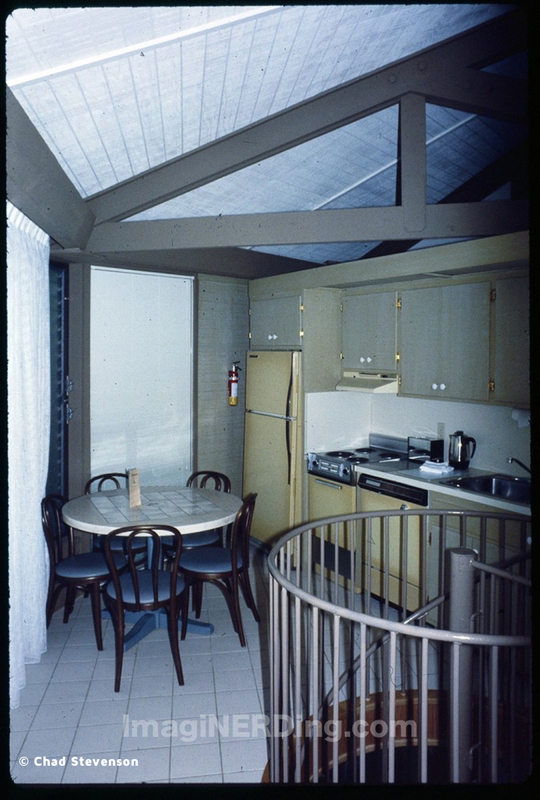 The Treehouse Villas had two bedrooms upstairs, along with a family room and kitchen/dining area. The downstairs had an additional bed, bathroom and washer/dryer. But more on that later. You can see another one of the family room chairs and the spiral stairway that led to the lower level. In this image, you can also see the tile floor of the kitchen and a the dining table. 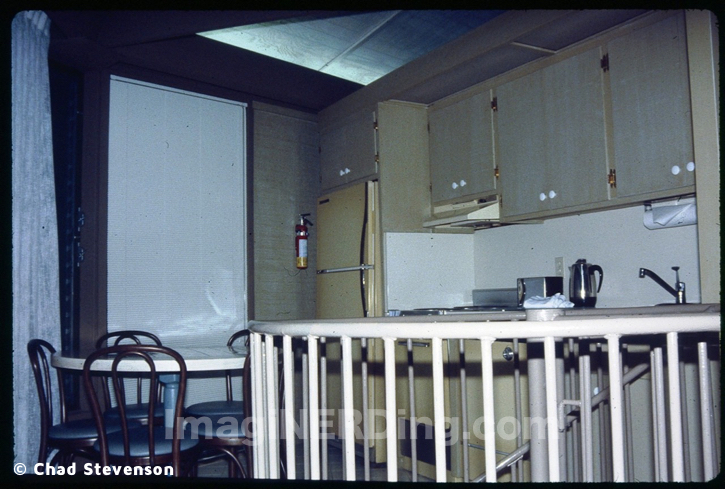 The following image shows the Treehouse Villas kitchen from (circa) 1973. I can’t tell if that’s a continuation of the carpeting or a vinyl that looks like the carpeting. This is an incredible image. The cabinets have been resurfaced and the island is gone. It’s been replaced with a large, round table and five chairs (probably too large for the kitchen). I’m assuming that the refrigerator, stove and dishwasher are the same. The countertops and backsplash were also changed from a wooden laminate to a white countertop and backsplash. Based on this photo and the one with Cadet Chad sitting on the couch above, I assume there were fluorescent lights along the ceiling. Granted, it could be an extension of the windows. The upstairs also had two bedrooms. The Birnbaum Guides state that one bedroom had a king-sized bed and the other had a queen-sized bed. The early descriptions state the the lower level contained a den instead of a bedroom. To sleep more guests, they originally had a sleeper sofa upstairs. Sometime around 1983, they must have changed it from a den to a third bedroom. Another amazing photo for the time! I can’t say how thankful I am that Cadet Chad’s dad snapped these photos. 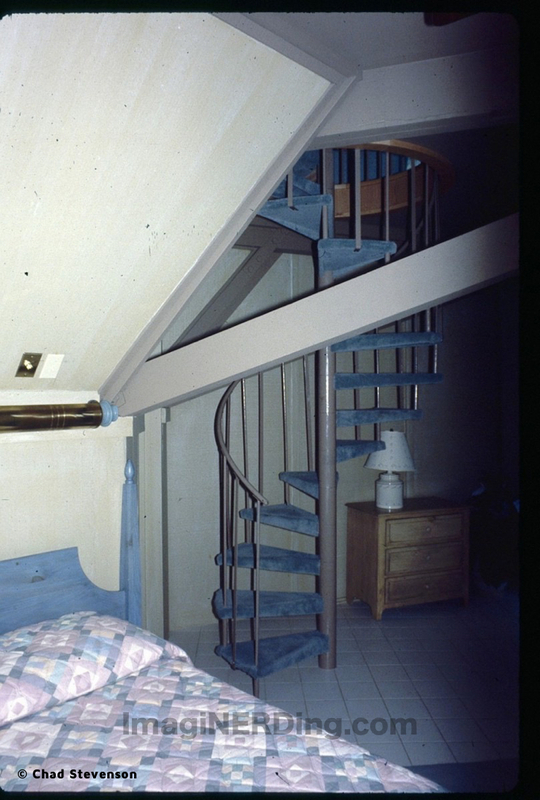 In this photo, you can see down the spiral staircase into the lower area. 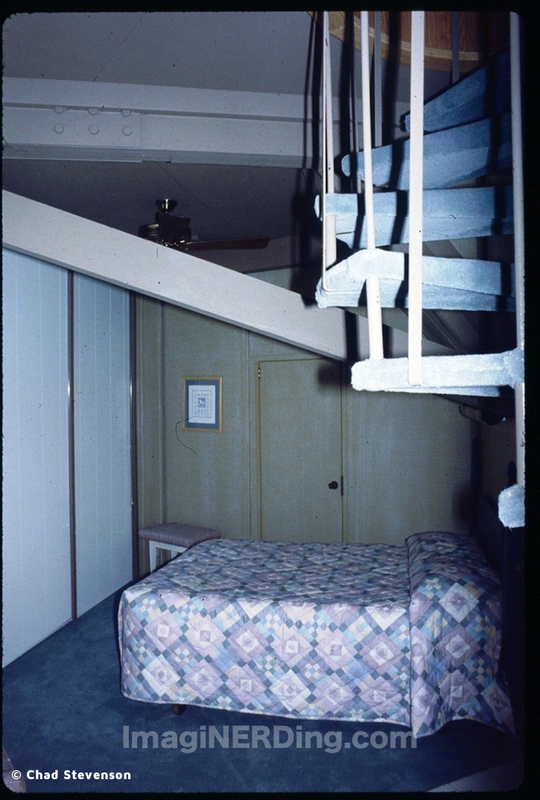 A shot of the bottom of the spiral staircase and part of the bed. There’s also a nightstand with a lamp. Again, I’m assuming that the “brass” bar above the bed is a light and the switch controls the light or the ceiling fan. And more great carpeting on the stairs! So, there was tile at the staircase landing and carpet where the bed was. Based on discussions with Cadet Chad, the door in the photo above was probably to the small bathroom that had a walk-in bathtub. Apparently, it was a bathtub in which part of the side wall moved for easier access (like a wheelchair). 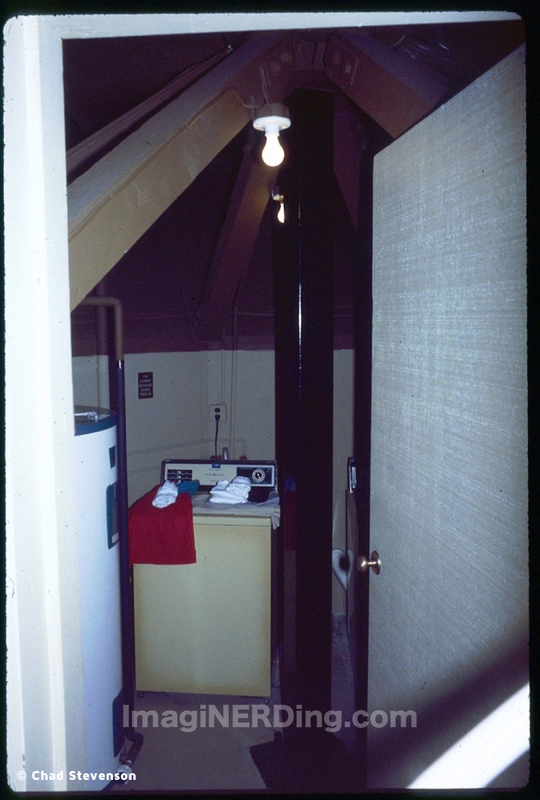 There was also a utility room, which is pictured below. A simple washer and dryer. The lower floor also had a door which led outside. 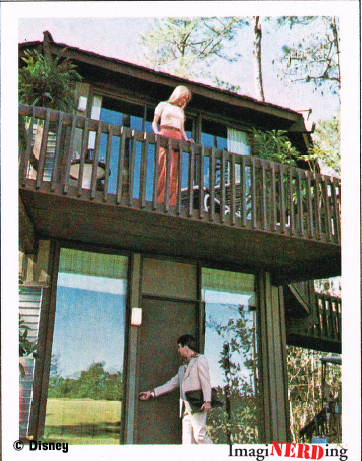 Did you ever get to stay in the Treehouse Villas in the 1970s or 1980s? I’d love to hear about it or share photos! Thanks for the nice article George. I remember this trip like it was yesterday. I stayed there when the downstairs room was a den. There was a couch, chair, coffee table and standing lamp. There may have been a tv but I can’t say for sure. 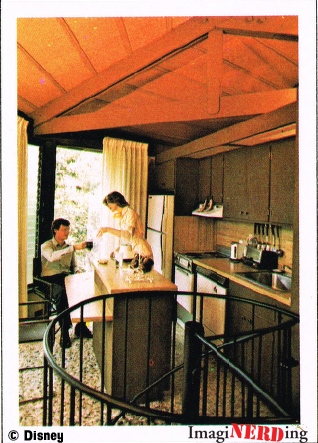 The kitchen had linoleum floors and the living space was carpeted. I stayed in one in 1976. Disney put me up there when I was there for a job interview, as they were way above what I could afford if I was there on my own dime. It was crazy having all that space to myself. 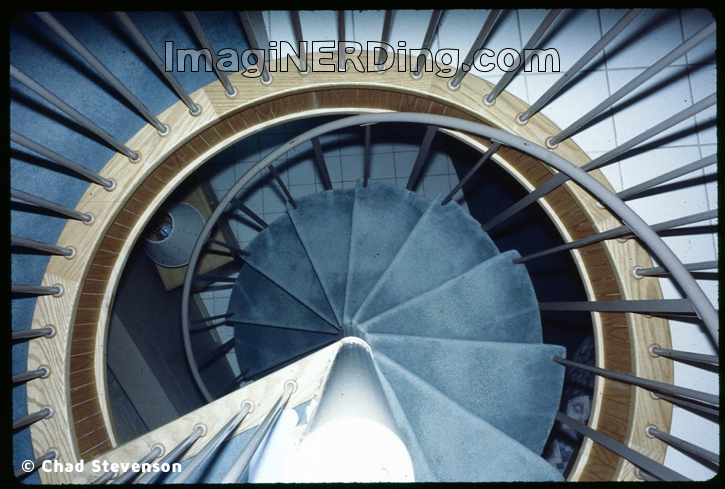 I remember the spiral staircase as it reminded me of the “Seaview” on “Voyage to the Bottom of the Sea”. I didn’t get any pictures then but have a few exterior ones from later visits.